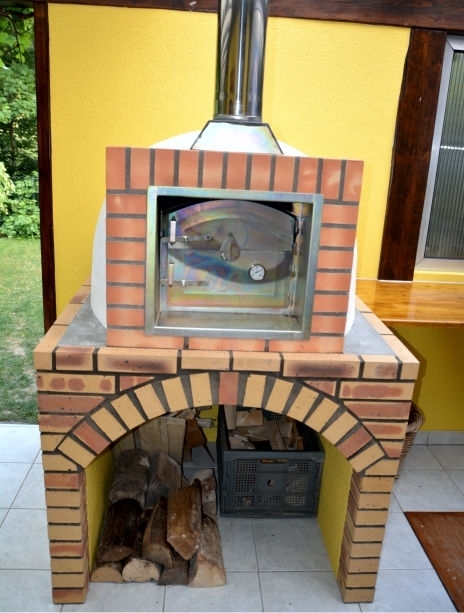 A great option in Wood Pizza Oven in Brick - PORTO 90cm ! Pizza dough freezes well so it makes sense to make large quantities at any one time. This recipe makes 3 or 4 medium sized pizzas. It is easy to double up the amount of ingredients if you need more. It should be soft, springy dough – not so soft that it‟s limp but not so stiff that it is hard to work with. Reserve 1 cup sauce for dipping. Divide dough into 4 balls. Work each ball into an 8" round shape. Divide the ingredients evenly among the 4 dough balls. Spread some Romano evenly and lightly over the ingredients and follow with the tomato sauce, half the provolone cheese, hard salami, capicola, basil, pepperoni and prosciutto, then finish with the rest of the provolone. Fold the dough over the ingredients and form a half circle. Seal the dough with your fingers. Dust the pizza peel (or pan) with cornmeal. Place the calzones on the pizza peel and brush with olive oil. Make sure to cut slits into each calzone to allow the steam to vent. Bake until golden brown. Remove from oven and allow to sit for a few minutes. Warm the excess sauce for dipping!